The two capacity auctions in Q1 will change the structure of the UK supply stack, peak pricing dynamics and margin capture for flexible assets. The UK power market is preparing for two capacity auctions in Q1 2018. There is no shortage of competition to provide capacity. The outcome of these auctions will be key to determining how the capacity mix will evolve over the next 5 years. In today’s article we look at auction dynamics. We also consider what a changing capacity mix means for the supply stack, price formation and prompt margin capture of flexible assets. This month’s T-1 auction for the 2018/19 capacity year looks very well supplied against a demand target of only 4.9GW. This points to a single digit clearing price, potentially low single digits. The auction will be fought out at the margin between the older CCGTs (e.g. Peterborough & Corby) and 36% efficient coal units (e.g. Fiddler’s Ferry, West Burton) that missed out in the 18/19 T-4 auction. Bidding will be driven by complex end of asset life economics. At least 2 or 3 large grid connected units are likely to miss out and may close as a result. Older existing thermal How much existing capacity is knocked out by cheaper new build, with a specific focus on the older 36% coal units with 35+ £/kW fixed costs and very low forward energy margin. New gas engines The volume of gas engines that manage to bid below 25 £/kW, despite a substantial reduction in triad avoidance revenue. A number of engine developers look to be under-pricing the risk associated with wholesale and BM margins in a chase for volume. New CCGTs Further efficiency increases with latest generation CCGT technology help with wholesale energy margin capture. This could lead to new CCGT projects bidding under 25 £/kW. Damhead Creek 2 looks to be the most advantaged project given its location. Batteries Large volumes of prospective battery projects will not necessarily translate into large cleared volumes in the auction. Developers of short duration batteries were dealt a heavy blow in Dec 17 with derating factor reductions (18% for 30 min, 36% for 60 min). Frequency response revenues are also at risk given the rapid scale up in battery volumes. Marginal price setting in the T-4 auction is likely to be dominated by competition between new gas engines, new CCGTs and older coal units. Unit economics suggest bids converging around the 25 £/kW level. But growing investor enthusiasm, and in some cases under-pricing of risk, is driving down project cost of capital. This opens up the risk of another downside price surprise e.g. to 20 £/kW. The UK supply stack is set to rapidly evolve over the next 5 years as older coal and gas units are replaced by renewables, interconnectors, gas engines and batteries. Chart 1 shows a simplified view of the 2021/22 supply stack. Renewables with low variable costs are being pushed into the bottom left of the stack, with offshore wind particularly important. This capacity is dominating the provision of new energy but also significantly increasing system intermittency. Thermal closures are causing the removal of flexible capacity from the middle to right hand side of the stack. 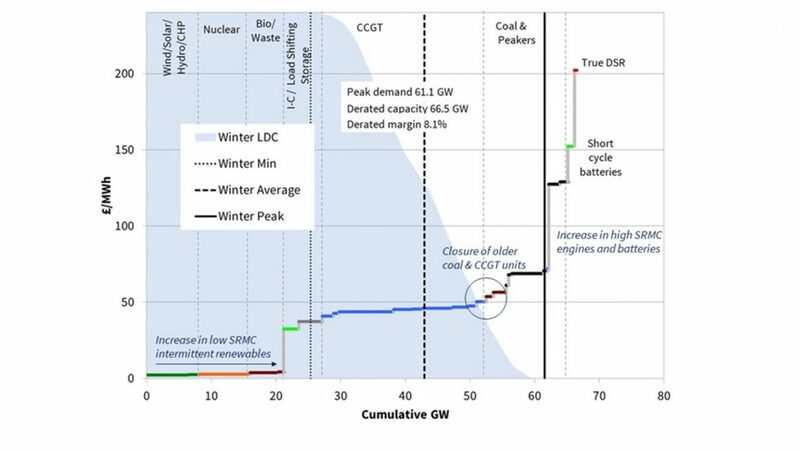 The pace of closure of the remaining 11GW of coal units will be particularly important as will the volume of older CCGTs that close or are converted to run as OCGTs. Gas engines and short duration batteries with high variable costs are being pushed into the top right hand side of the stack. These units are dominating the provision of new flexible capacity. But they have higher variable costs (e.g. 70+ £/MWh for 35% efficient gas engines) than the coal & CCGT units they are replacing which will drag up system prices when they are required to run. So while the capacity market is currently well supplied, the energy market is likely to see increasing peak price shape & volatility over the next 5 years. A growth in renewable output is gradually eroding the load factors of CCGTs. But rising peak prices and volatility have a positive impact on CCGT margins. A higher volume of system intermittency is going to manifest itself in higher prompt price and Balancing Mechanism volatility. Marginal prices may swing from low or negative levels in periods of low net system demand, to being set by 70-90 £/MWh peaker costs when there is high net system demand. This is going to significantly increase the emphasis for flexible asset owners on optimisation of unit flexibility against prompt prices. The risk associated with forecasting cashout prices i.e. getting it wrong costs you money. The impact of large volumes of new gas engines and batteries in dampening the impact of rising cash out price volatility. Some engine and battery developers are ‘pricing for perfection’ i.e. assuming that BM returns will only improve. This may be setting up some painful writedowns in the 2020s. The other interesting dynamic looming on the horizon is longer duration energy storage. The economics of 4-6 hr duration batteries do not yet support large scale rollout. But the pace of battery cost declines suggests that load shifting arbitrage will start to feature from the mid 2020s. The combination of grid scale and distribution connected storage arbitrage may be a game changer. We have just published a briefing pack on the implications of the UK capacity mix transition for flexible asset value. This pack can be downloaded here: “UK power: capacity mix transition driving flexible asset value“.